A West Coast pale ale brewed with Citra and Mosaic hops. A giant can of Bone-A-Fide is just the right amount for two Humulus lupulus lovers to share over dinner. Pulling the tab provides a sensual experience—citrusy, herbal and coniferlike even before the first sip. Decidedly hoppy, but not bitter on the palate. The hop flowers are a little too powerful for delicate foods, but then, who wants delicate food? Bring on the ribs, baby-back pork or big-boned beef, with spicy barbecue sauce. Eat, drink and be merry. You’ll love creating your own bone yard! Within a nanosecond, the fantastic aroma of hops hits me. It’s a super-sized serving, and I’m feeling like I’ve won the lottery. The delicious, chewy, fruity, earthy aroma of hops is abundant. The flavor follows and does so without an assault of bitterness. The palate pauses … is this really happening to me? Terrifically full, hoppy pale ale. 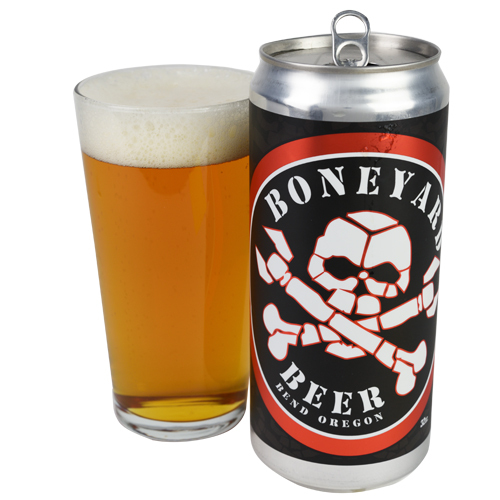 Yes, this is a bone-a-fide pale ale. It ranks with the best ones I’ve ever had and is certainly a great accompaniment with food of all sorts. Highly recommend this one in the company of others. Enjoyability off my charts. Great job, brew crew.